-Israeli children’s author, Miriam Roth, 1969. During a recent trip to the Middle East, I set out to explore books Israeli parents share with their children. 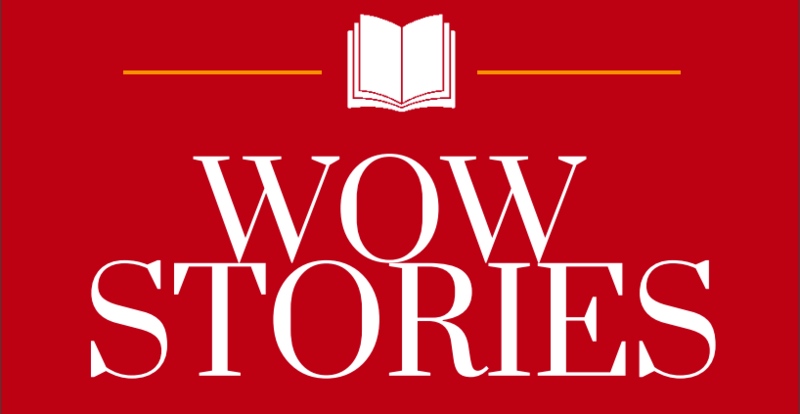 This journey grew out of a cross-cultural research project involving Israeli and American mothers reading to their Kindergarten children. I wanted to understand some of the books my research partner, Vered Vaknin-Nusbaum, plans to share with Jewish, Druze and Muslim families. My book informants included Vered, two colleagues from her college, Hagit and Yehuda, and three other Israelis, Sima, Janet and Britt. In the midst of excursions to various bookstores, these parents regaled me with literacy stories, thus deepening my understanding of the role of children’s books in their family lives. 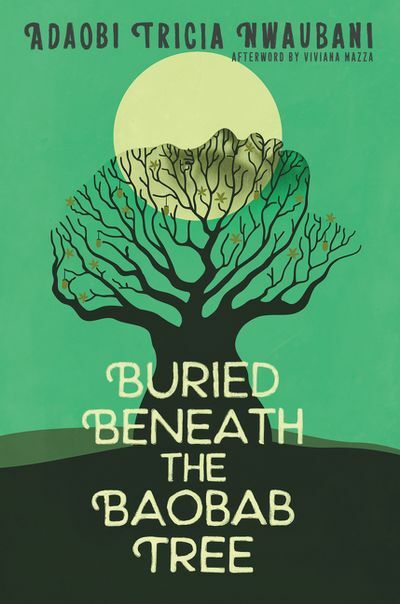 These four August blogs focus on children’s books I discovered through conversations with these six Israelis. The children’s books are almost all written in Hebrew. 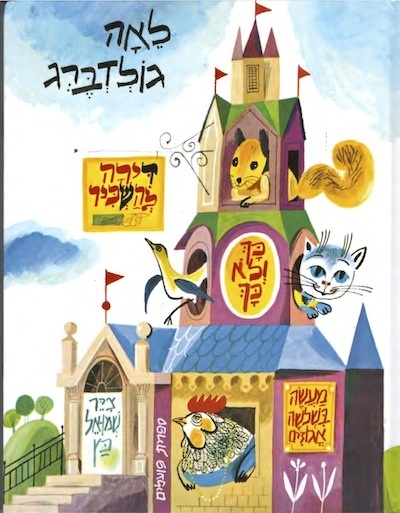 In each week’s blog one or two of the highlighted children’s books are translated but I purposefully chose to share books written in Hebrew, thus inviting teachers to consider books written in another lexicon. Just a simple tip as you explore these treasures: the Hebrew language reads right to left, not left to right as the English language. The first author, Lea Goldberg (1911 – 1970), is considered one of Israel’s classic writers. After immigrating to pre-state Israel in 1935, Goldberg taught Comparative Literature at the premier Hebrew University in Jerusalem, all the while prolifically publishing poetry, novels and plays. She also authored 20 children’s books, receiving many prizes for her varied works, including the Israel Prize for Literature in 1970. In summary, the story relays the dilemma facing four apartment tenants trying to rent the fifth apartment in their building. “The tenants of an apartment building are the fat hen, tidy black cat, busy cuckoo bird, and voracious squirrel. They are trying to rent out a flat, previously occupied by the mouse, who left suddenly. The potential tenants, who come to look at the flat, seem to like it, but each has reservations about one of the neighbors. The hard working ant will not live with a ‘lazy hen’. The motherly Rabbit won’t live with a cuckoo bird, who ‘neglects’ her offspring. The musically sophisticated nightingale can’t stand the noise raised by the nut-cracking squirrel. And worst of all, the white pig won’t live with the cat, just because she is black. At last, comes the dove. She is not too impressed by the apartment, but finds merit in each of the neighbors and decides to live in their good and peaceful company,” (Halabe, 2005). To enjoy Goldberg’s entire lyrical text, visit http://www.hebrew-with-halabe.com/children-literature/dira8bb.htm. The rhythmic flow evident in Goldberg’s verbal exchanges between animals seems reminiscent of Mem Fox texts like Hattie and Fox (1985) or Michael Rosen’s We’re Going on a Bear Hunt (2001). The following pattern occurs as each new prospective tenant considers moving into the vacant flat. Do you like the rooms? They are nice. Do you like the kitchen? It is nice. Then dwell with us! No, I won’t! Rahel Halabe (2005) notes Goldberg’s view that children’s literature is a medium for language acquisition and her lack of restrain from using difficult vocabulary, which she claims children absorb over time. I could not help but notice how the problem-solver comes in the form of the eternal symbol of peace, the dove, eager to live in harmony with the other four tenants. Halabe suggests that adults use Goldberg’s text, depicting the lack of tolerance in the world, to initiate discussions concerning the multicultural make-up of Israel today. Additionally I see this classic as a tool for teachers, always striving to help students overcome the desire to make snap judgments or harsh comments about others. Lea Goldberg’s second children’s book, The Naughty Boy, also written in 1959, focuses on a preschooler struggling to cope during a visit to a relative’s house. The boy’s alter ego, the naughty boy, is familiar to adults and children, since everyone struggles with Jekyll and Hyde tendencies we hope to keep hidden inside. When my son was 3 year old, I recall hunting for books like this, to help us reconsider his temper tantrums. Some of our favorites included When Sophie Gets Angry, Really, Really Angry (Bang, 2002), The Way I Feel (Cain, 2000) and No, David (Shannon, 1998). 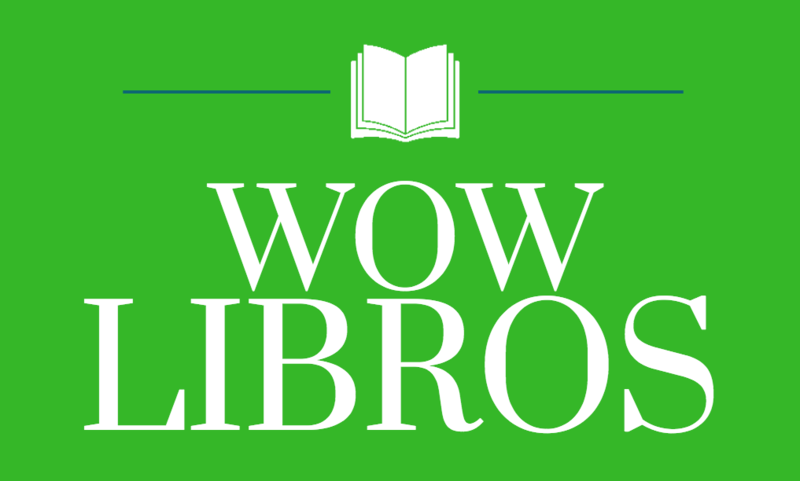 I will save further discussion of this great read for next week’s blog since it is a current title given to Jewish families participating in the PJ Library, a national literacy program for preschool families. Miriam Roth (1910 – 2005), the second renowned Israeli children’s author began writing books for young children at the age of 61. 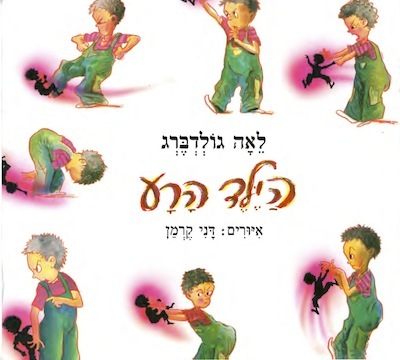 Her writing demonstrates a deep understanding of children and their unique issues, obtained through years of teaching Kindergarten, training Kindergarten teachers and teaching children’s literature (Mashiach, 2009). Roth immigrated to pre-state Israel (Palestine) in 1931. After studying at Hebrew University and earning her masters of education from Teacher’s College in New York City, Roth went on to write not only 23 children’s books but also education and children’s literature texts. At the age of 92, Roth received the Bialik Prize for Literature, one of only 15 children’s authors to receive this esteemed award in 79 years. 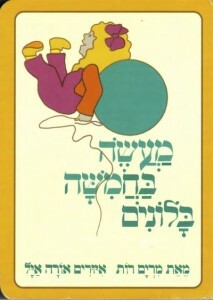 A Tale of Five Balloons (1974) is considered “one of Israel’s most beloved stories” (Abbey, 2011) since the text helps children consider a universal issue of loss. The genius in this simple text involving the popping of five balloons, one for each preschooler, can be seen when pondering how conversations resulting from sharing this book pave the way for consideration of more permanent losses later in life (i.e., losing a pet or a friend). Miriam Roth once revealed how the storyline for this book evolved from her efforts to comfort her own children when a balloon she brought home after a visit away from their kibbutz would burst (Halkin, 2005). When Vered saw this classic, she quickly recalled using the book to explore number and color concepts while reading with her three children. Hagit never considered the need to study specific concepts when enjoying this book with her three children. Instead she simply immersed them in the rhyming, musical language. A Tale of Five Balloons parallels texts I shared with my son during his preschool years. The Hello,Goodbye Window (Juster, 2005) to explore separation or Knuffle Bunny: A Cautionary Tale (Willems, 2004) to consider the loss of a stuffed animal enabled us to contemplate small losses. Enjoy the complete translation of Tale of Five Balloons at dc438.4shared.com/download/94B1xim3/a_tale_of_five_balloons.docx . 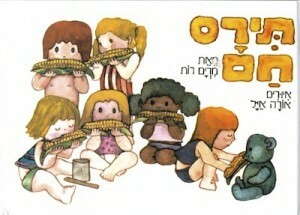 Roth’s rhythm and rhyme in Hot Corn (1978) invite children to chant along with six youngsters in search of some hot corn on the cob. Bim, bam, bam! Bim, bam, bam! Here is a brief summary – “Ofir happily takes a walk on a hot day, humming to himself “Bim bam bam, tiras cham” (Bim bam bam, hot corn). A group of children join him, assuming that he’s headed somewhere where corn awaits. Ofir tells the children that it’s just a song, and there’s no promise of corn. At first they are disappointed, but later on the grandfather of one of the boys actually does give them all ears of corn.” (Baruch, 2012). for further information on Communal Child Rearing (Sima Shimony, 2008). Yehuda regaled me with tales of mischievous escapades pulled off during his early days in the children’s home. Most Israeli parents living on a kibbutz today choose to have their children live with them in their own homes. Through texts like Hot Corn and A Tale of Five Balloons, Roth aspired to establish a new genre for children, centered upon typical Israeli life experiences, instead of Zionist themes. She wanted to help children “learn a lesson from the fate of others, expand their view of the world, improve their language, enrich their ability for expression, and upgrade their ability of moral judgment” (Roth, 1969, p. 17). Goldberg, L. (1959). A Flat for Rent. Tel Aviv, Israel: Sifriat Poalim Publishing Group. Goldberg, L. (1959). The Naughty Boy. Tel Aviv, Israel: Sifriat Poalim Publishing Group. Roth, M. (1974). A Tale of Five Balloons. Tel Aviv, Israel: Sifriat Poalim Publishing Group. Roth, M. (1978). Hot Corn. Tel Aviv, Israel: Sifriat Poalim Publishing Group. 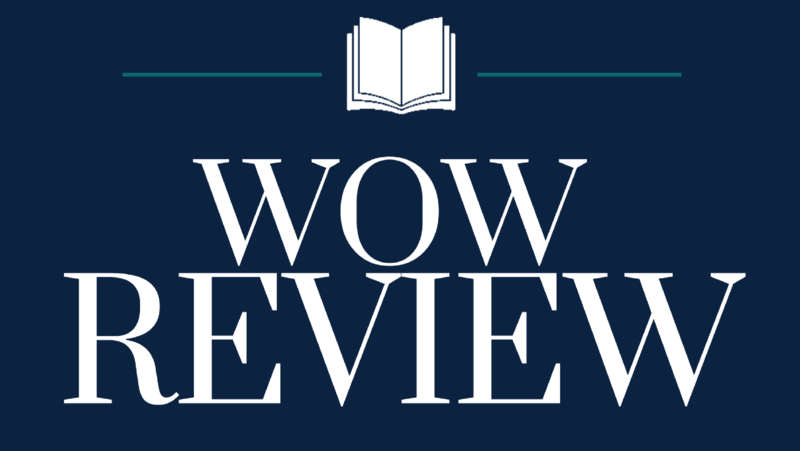 I must thank Emily Peffer, graduate assistant, Department of Education, Westminster College, for her careful work in searching for Hebrew translations and author information. In a beautiful valley, among vineyards and fields, there stood a tower with five floors. Who lived in the tower? On the first floor lived a fat hen. All day long she is at home, lolling in her bed. She is so fat, she can hardly walk. On the second floor lived a cuckoo bird. All day long running around, visiting; her children, you know, live in different homes. On the third floor lived a clean, coquettish black cat with ribbon on her neck. On the forth floor there lived a squirrel, happily cracking an munching on nuts. And on the fifth floor, used to live Mr. Mouse, but a week ago he packed and left. No one knows why and to where. Then, through paths, ways, and roads, new tenants came to see the place. First came an ant. She climbed to the fifth floor, read the sign, opened the door, stood inside and looked around. Do you like the rooms? Do you like the kitchen? Do you like the hallway? Then dwell with us, Ant. I don’t like the neighbours. How can I, the ant, dwell in the same house with a lazy hen, lolling all day long in her bed? She is so fat, she can hardly walk. And the ant went on her way. The ant went away, and the rabbit came in. She climbed nimbly to the fifth floor, read the sign, opened the door, stood inside and looked around. Then dwell with us, Rabbit. I don’t like the neighbours. How can I, a mother of twenty bunnies, dwell together with a cuckoo, who deserts her children? Her children grow up in a strange nests. All of them deserted, all of them neglected. What would my children learn from them? The cuckoo bird was hurt. And the rabbit went on her way. The rabbit went, and a pig came in. He read the sign “Flat for Rent”, and after reading he rolled up, climbed the stairs and opened the door. There he stood, and looked around with his small eyes on the walls, on the ceiling and on the windows. The kitchen is nice, but it is not dirty enough! I don’t like the neighbours. How can I, the pig, white, son of whites from the day of creation, dwell together with a black cat! This doesn’t suit me! No way! No how! Go away, go away, pig! This doesn’t suit us either! No way! No how! The pig went away and the nightingale came in. No, I won’t. I don’t like the neighbours. How can I sit quietly and calmly, when a squirrel keeps cracking and munching nuts all day long. Oh, the noise is horrible, terrible, ear splitting. And my ears are accustomed to other sounds, to sounds of songs, to songs of hymns. And the nightingale went on his way. The nightingale went, and the dove came in. She quickly climbed to the last floor, read the sign, opened the door, stood inside and looked around. The rooms are quite narrow. Do you like the kitchen? The kitchen is nice, but not large enough. The hallway is full of shade. The hallway is very dark. You won’t swell with us, then? I know that we can all live together, happily and peacefully, in such a good company. And the dove rented the flat and there she sat every day, cooing in her room. And thus, in a beautiful valley, among vineyards and fields, stands a tower of five floors. And in the tower, to this day, live all the good neighbours together, happily and peacefully. As a middle school educator constantly searching for texts to layer in order to deepen understanding, I really appreciate the comparisons you provided in this blog. Thank you for detailed research and background work. While reading about these Israeli children’s books, I couldn’t help but notice that each of the stories had plotlines similar to those found in American children’s storybooks. I also found it interesting that certain stereotypes, for example the stereotypes of each of the animals in A Flat For Rent, remained true in other languages as in English. This helped me realize that, once translated, these same books could be helpful in American classrooms with children of any cultural background. Although I have not read any of the American books that were related to these stories in the post, I could see my own relations to what I remember reading as a child. I should also state that I noted what was written about each of the books above in relation to language acquisition. Each of these stories are used to teach children the underlying meanings or for rhyming and rhythm rather than vocabulary, which children will “absorb over time.” This helps support the fact that as a people, rather than only American people, we read to gain meaning, even at a young age. Sheryl’s notion of readers in all countries exploring texts to consider new ideas is a notion I keep re-learning from family members who read with their children. They read to consider life together. At first, I was not to excited about reading Israeli children books because I did not think they would relate to me. Once I was done, I was quite surprised because they reminded me of children books in America. This helped open my mind to the fact that no matter what part of the world you are from or what language we speak, we all relate to similar things. I realize how important it is for me, as a teacher, to work my hardest to help foreign language students in my classroom. I will make sure to have foreign language books in my classroom. Also, I noticed how the stories rhyme. This means other cultures also believe you can learn words by listening and association.